Welcome to the Dropshirt Dashboard. A place to connect your products to our production house. By Adding an order you will be connecting directly to a human operator at a t-shirt printing workstation for end-point efficiency. 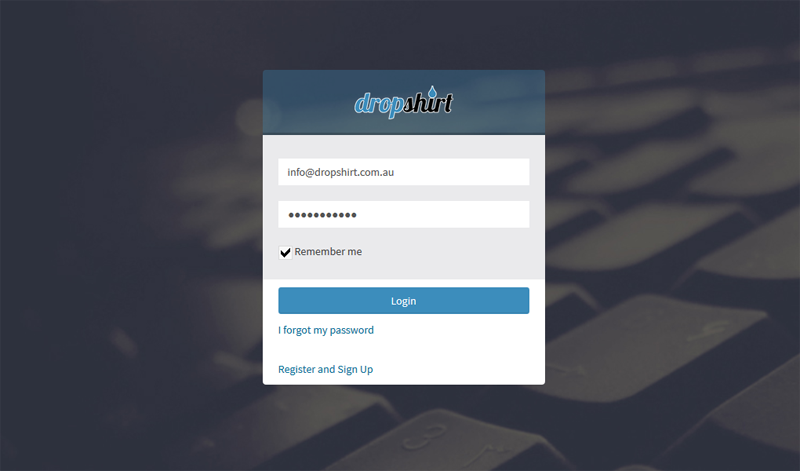 Dropshirt offers a simple system to connect Australian web store owners to a t-shirt fulfilment centre at wholesale prices. To use the application you will need the following. On the order form you will see all of YOUR details. If you want to send a sample to your billing address, leave delivery details. If you are shipping to a different address, then you will want to tick the "Use Different Delivery Address" check box. 1. 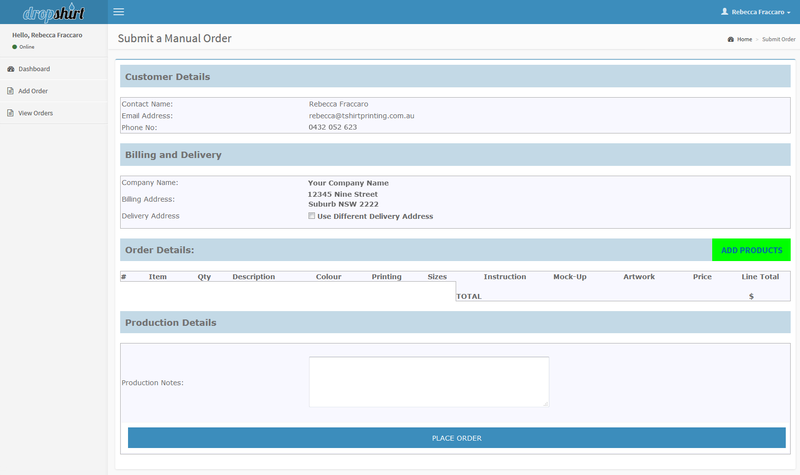 Send a sample to your billing address, leave the delivery details as they are. 2. Shipping to a different address, then you will want to tick the "Use Different Delivery Address" check box. 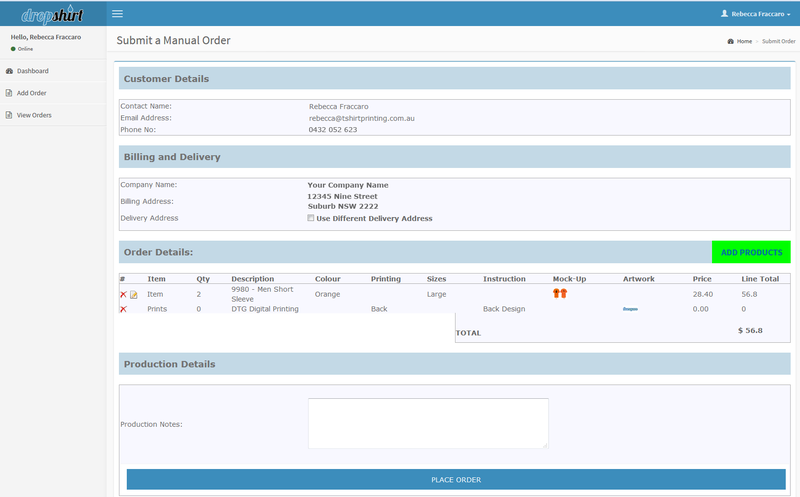 Fill in the delivery details of the customer you want the order shipped to. On the order form you will see a Green Button called "ADD PRODUCTS"
This form has 2 parts. Part 1 is the "Item" - This is the base product we will be adding a print onto. (See all our products here) You will need to Add one ITEM at a time. You need to add the following fields for an item. 6. Our wholesale price for that item (each) (Calculate the price of your item by using our product list) - Please do not add the dollar symbol into the price field. Part 2 Is the Print - Each item can be decorated with up to to 2 prints per item. 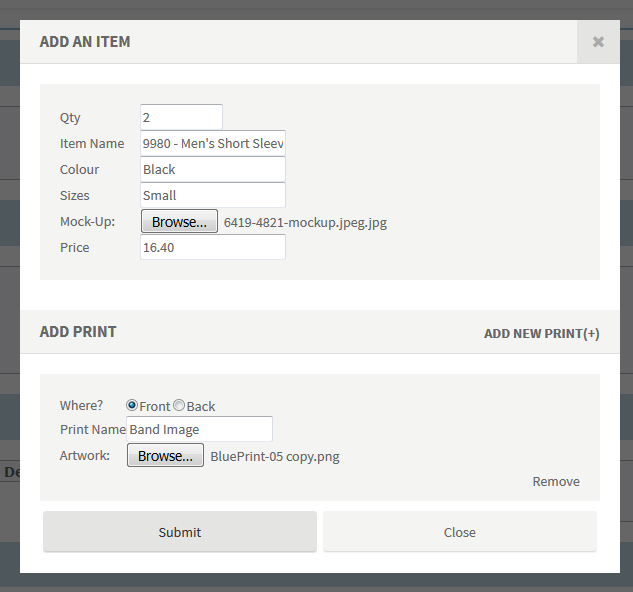 Click the "ADD NEW PRINTS" to add more prints. Click the "Remove" to delete a print. You need to add the following fields for the print. Fill in the form with the details of your order. See the image below as a guide. When you have finished - Click the "Submit" button. Please tell us the shipping method in the production notes. You can use this field to add some other notes for our production team. 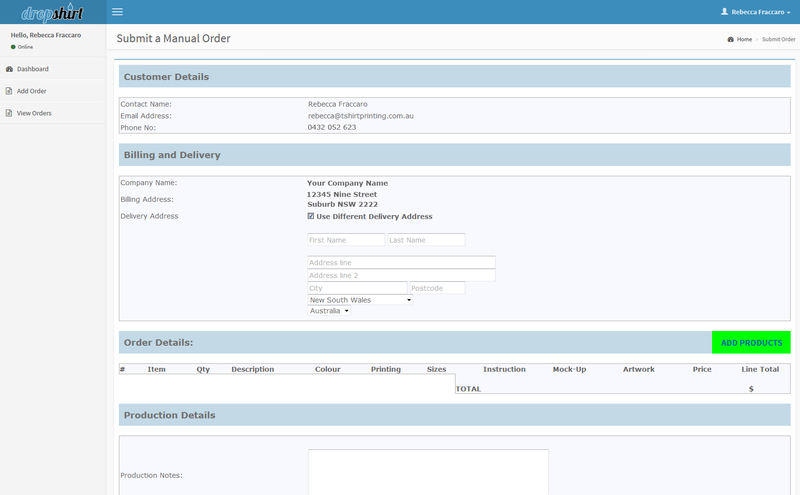 When you have finished adding your product(s) and comments - Click the big blue "Place Order" button. Your order will then be sent to our production house.